A report out Wednesday on the state of U.S. public schools finds performance is relatively flat. But the study from the University of Washington suggests Cincinnati's public and charter schools are making progress. 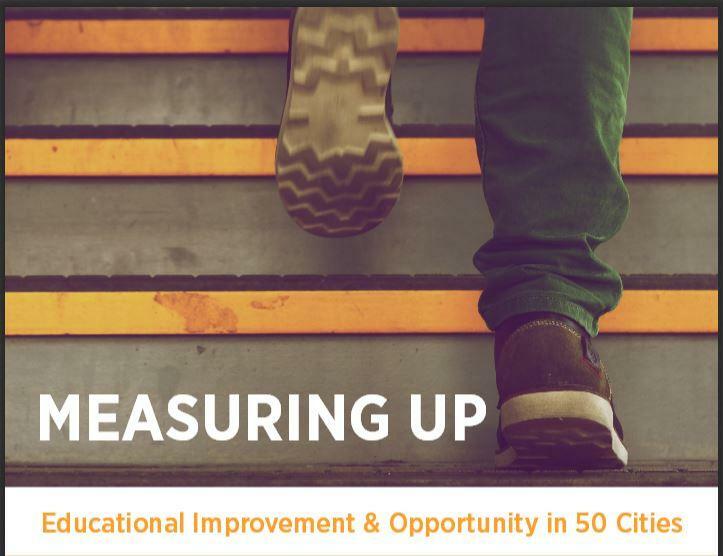 Measuring Up: Educational Improvement and Opportunity in 50 Cities by the Center on Reinventing Public Education says Cincinnati does well when it comes to enrolling Hispanic students in advanced math courses, and having low gaps among racial groups taking college placement exams. Senior Research Analyst Michael DeArmond says one third of Cincinnati students are in a school that outperforms similar schools statewide. "Across the 50 cities that we looked at about eight percent were in those schools, "DeArmond says. "But in Cincinnati the number is much higher. There is a larger number of students in schools that are really game changers for outcomes in their city." The report also shows increasing numbers of students taking advanced math classes and college entrance exams. However, it suggests there are proficiency gaps in math and reading among students who receive free or reduced price lunch (FRL). And it shows there are still big gaps in which students are enrolled in higher performing schools. Cincinnati Public Schools Superintendent Mary Ronan says the recent change in the magnet school enrollment process is one way the school board is tackling that disparity. "Moving to a lottery as opposed to 'first come, first served,' they feel will greatly assist so that everyone has an equal chance of getting into our high performing schools," says Ronan. "But I've also been tasked with creating more quality seats in our portfolio of schools." Overall, Ronan says she's thrilled with the results because they show the district is improving. Marketplace Morning Report also reported on this study. One out of three Cincinnati students enrolled in a school that outperformed similar schools statewide, a much higher number than the 50-city average. Hispanic students took advanced math courses at higher rates than white students. Cincinnati had low gaps among racial groups taking the ACT/SAT; Hispanic students took those tests at higher rates than white students. Are children of color and low-income children benefiting from the best that Cincinnati has to offer? How do Cincinnati’s low income students perform compared with their more advantaged peers? Are Cincinnati schools creating a path towards college? Cincinnati Public Schools is holding a series of informational meetings about its new magnet school lottery system. The Ohio Supreme Court decision that nearly a hundred million dollars in equipment bought by charter school operators with tax money belongs to those operators and not to the schools has raised more anger against the industry. The Ohio Supreme Court has sided with a controversial charter school operator in a very narrow decision. The case involved 10 Cleveland-area charter schools that contracted with White Hat Management to operate them.